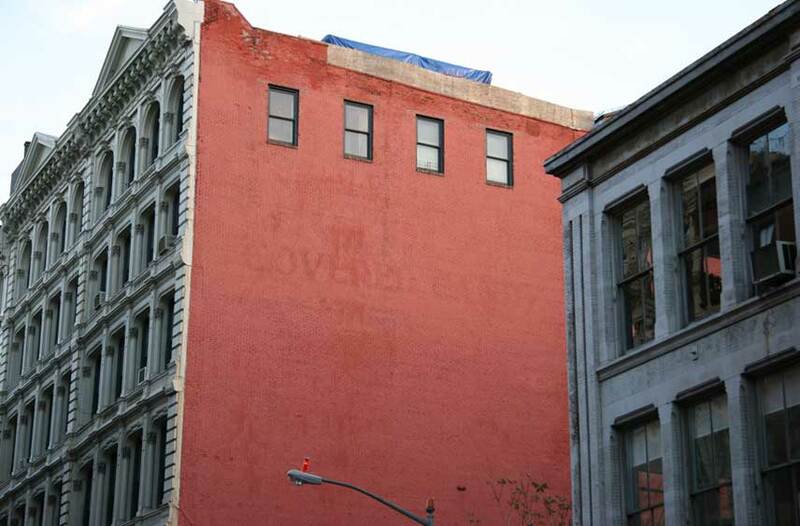 Faintly visible through a thick layer of red paint, the words Covered Candy, identify the location of Pasquale Margarella's confectionery here at 477 Broome St. in New York's SOHO cast-iron district. Originally the sign would have included the word Chocolate. One of the Margarella specialties was Chocolate-Covered Candy. In fact, it was just this chocolate-covered candy that ran him afoul of the U. S. Secretary of Agriculture, when, in 1935 he was accused of adulteration and misbranding for several shipments out of state of candies falsely identified as chocolate-covered. The defendant pleaded guilty and was fined $880. The defendant was Pasquale Margarella (1882-1971), born 2 Nov. 1882 in Spinoso, Italia, who immigrated to the U. S. from Napoli 5 Dec. 1898 aboard the vessel Alessio. He was recorded in the 1915 New York State census, age 43, living at 119 Washington Place, Manhattan, when his occupation was "flower manufacturer." He was in business in New York from 1907, and for 40 years a confectioner located at 477 Broome St. (1915 to 1955). He registered for both the World War I draft (1918) and the World War II draft (1942) as self-employed, candy manufacturer, at 477 Broome St. His Declaration of Intention to Naturalize dated 24 Jan. 1911 stated that he was 28 years old, born 2 Nov. 1882, and that he lived at 242 Spring St., Manhattan. The following is quoted from Italians in New York by The Guilds' Committee for Federal Writers' Publications, Inc., 1938, "The Margarella Candy Corporation, established in 1904, is the largest Italian candy manufacturer in New York. The owner, Pasquale Margarella, was born in the little town of Spinoso, Basilicata, and emigrated to America in 1898. At first he worked as an apprentice at various candy factories. After six years' study of the American candy trade, he established his own plant. By introducing Italian confections and applying modern American manufacturing methods, he became a millionaire. His employees number 200, and the annual production runs into tons." Little Italy (Images of America Series), 2002, by Dr. Emelise Aleandri, includes the following on Margarella, "Pasquale Margarella maintained his six-story chocolate factory (right [referring to illustration]), his distribution warehouse, and his administrative offices at 477-481 Broome Street in 1921. He was born in Spinoso, Potenza, in 1882, and came to New York in 1898 with little money or support. However, he was only 16 years old and in good health. He did whatever work he could get and managed to save his earnings, since he was alone and had few expenses. He saw how other Italians were succeeding in the candy business, so he took his savings of a few hundred dollars and opened a small store in the basement of 182 Varick Street. At first he did not do well, but he persevered and eventually managed to get credit. Finally, in 1914, he was able to secure the factory on Broome Street. By 1921, he was producing 30,000 pounds of chocolate a day and his factory was worth $250,000. He contributed to Italian charities, donating $5,000 for the blinded Italian veterans of World War I." This ad for P. Margarella appeared in Confectioners Journal, Sept. 1922. From 1922 to 1955 Margarella lived at 76 Washington Place, a half block from Washington Square, between Macdougal St. and Sixth Ave. The 1940 U. S. Census indicated that Margarella owned this residence. 477 Broome St. (1885, Elisha Stiffin) has a cast iron facade, and the sidewalk in front has vault lights marked Burnet Jackson & Co. and Excelsior Iron Works. For more on these see the Burnet, Jackson & Co. page. A partial view of the Margarella Chocolate sign can be seen in a photograph dated ca. 1974 at the Museum of the City of New York. This is a photo by Edmund V. Gillon, Jr., who did the photographs in Margot Gayle's Cast-Iron Architecture in New York (1974). This view shows that the sign refers to the World's Fair, which means the sign was painted no earlier than 1939.